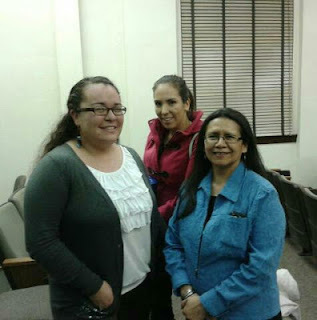 Newspaper Rock: Reese: Illinois wanted "dancing Indian"
By Rawan SalamehIn 1994, Reese and her husband drove from the reservation in New Mexico to Illinois to begin graduate school with their young daughter, Liz. She said they left because they did not fit the description of a typical Native American. “This place insisted on us not being the kind of Native Indian we actually are, they wanted a certain kind of Indian, they wanted a dancing Indian,” said Reese. According to Reese, people wanted her to come dance for them or tell stories, but they did not want to learn about the culture. Chief Illiniwek, the former mascot of the University of Illinois, was a big reason why it was so hard for natives to feel at home. According to Reese, the mascot represented stereotypes of the culture that were too offensive to accept. After a long struggle with the native people, the university finally retired the mascot after 80 years of representing the Fighting Illini. Reese stressed that the problem with the mascot is that he mimicked traditional and sacred native rituals. 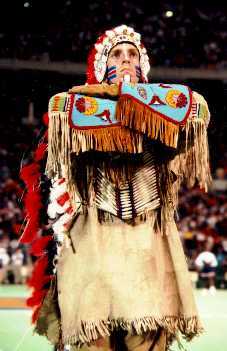 Most of what the mascot performed were inaccurate stereotypes of native people and were offensive to the native culture. Studies show that these stereotypes have a negative effect on the education of Native American students. Reese said native students drop out of college because they stop caring and lose motivation, which is caused by the misrepresentations of their culture. Comment: If I understand Reese, this is a surprising story. College-level students expected her to be a "dancing Indian" like their former mascot Chief Illiniwek. They couldn't deal with a real Indian who didn't fit their stereotypical notions. Their dissatisfaction with her was so great that it basically forced her to quit. Wow. If an experienced Native professional feels pressured to change or leave, think what it must be like for young Native students. What are you supposed to do when people constantly challenge you? You can fight back, but that may cause stress and exhaustion. Or you can give up and go home where people understand you. For more of Reese's thoughts, see Blue Dolphins Begins with Massacre and Lost Mesa in Fablehaven. Below: Notice the resemblance between Debbie Reese and Chief Illiniwek next to her? No? Curiously, this is never said to the being on Facebook with a Kirby Sattler picture in his/her profile and lots of "wolf faces in the sky" art.